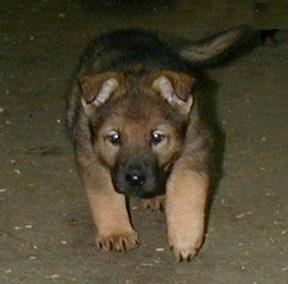 Yeltsa is the daughter of our SCH3 DDR Stud dog V Lux vom Kameruner Eck , out of our retired female Elba z Esagilu. 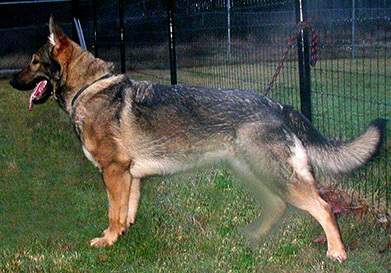 Her pedigree from her father Lux brings Tino vom Felsenschloss as well as the excellent world renown DDR Producer Lord vom Gleisdreieck, known to produce excellent tracking and extreme protection abilities into their offspring. 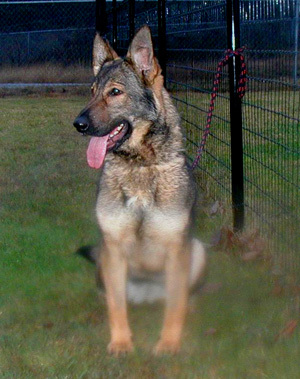 From Yeltsa's motherline, her grandsire is the excellent producer and well known Border Patrol Stud dog Xero z Pohraniční straze. 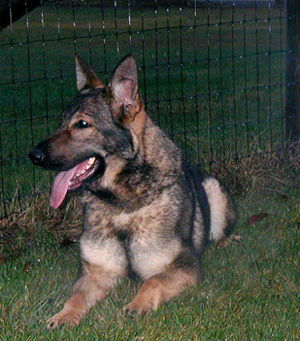 Xero is the most famous producing son of his well known highly sought after father, Grim z Pohraniční straze..Grim is well known for producing compact, substantial dogs with large head type, high defense and civil temperaments. 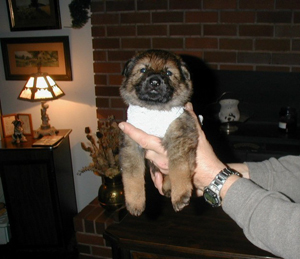 Yeltsa's grandmother is Figa Cega, a super producing female having several excellent working litters to her credit,. 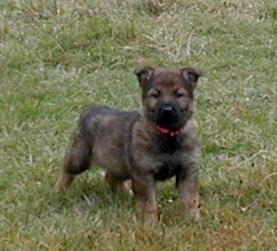 Born an only pup in Elba's final litter, Yeltsa proves herself to be a fighter in the world of survival. 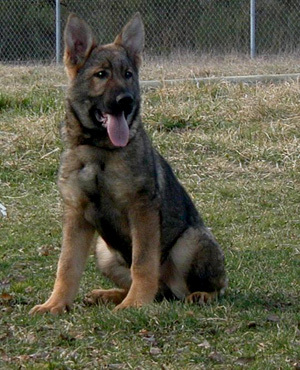 Weighing in at 26.5 ounces at birth, she is the largest pup we have ever had here at our kennel. At 2.5 weeks she is highly advanced for a pup of her age and clearly demonstrates recognition of voice, comes to the sound of your voice when called, and is confident and sure, willing to investigate new things at this very early age. 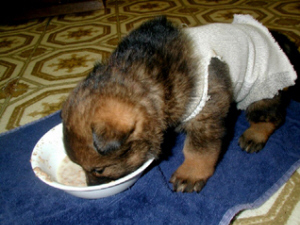 At 3 weeks she is eating 3 full meals a day, and is highly food driven, as is her mother. Her wagging tail confirms her enthusiasm to greet you when she hears you approaching. As a mature female, she is proving to be is a fun loving girl demonstrating a very good nose, is protective of her home front with good protection and alerting skills when strangers approach. Exhibiting good social character, Yeltsa is excellent with children and has proven to be a very good mother. 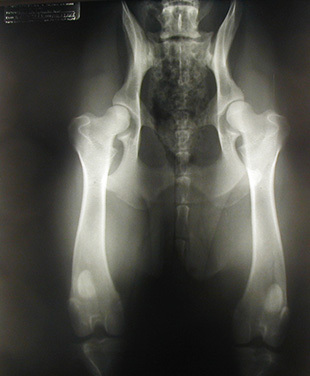 Her body type is agile, strong and athletic with substantial bone and very nice head type, producing pups which are also healthy, active and robust with substance and good confidence. was born on September 11th, 2014. V Gerry von Weltwitz, IPO3, FH2, A1. 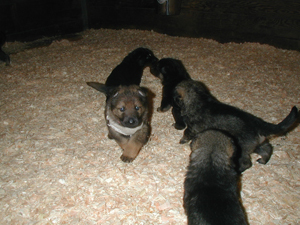 April 8th, 2010. with 5 Males and 4 Females. 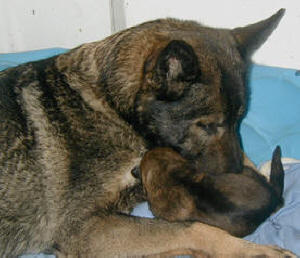 bite imprinting exposure as pups. 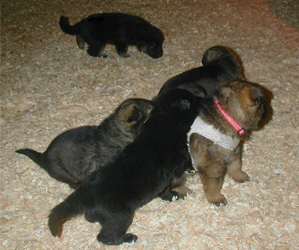 They are very nice dark black sable in color. 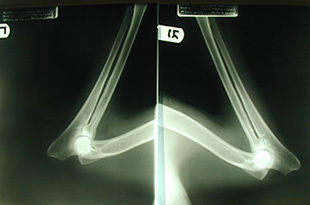 Chachar Bily Trpaslik , SVV1, Hips A1. Yeltsa meets her half siblings from Xena's Litter, who were born 3 days after Yeltsa. In order to encourage and support Yeltsa's mastering of her socialization skills, our goal is for Yeltsa to be integrated into her new family with her half siblings. It will be beneficial for her if she can become their family member, as the pups learn to interact with one another and to accept others. For their first encounter everyone is getting along OK.